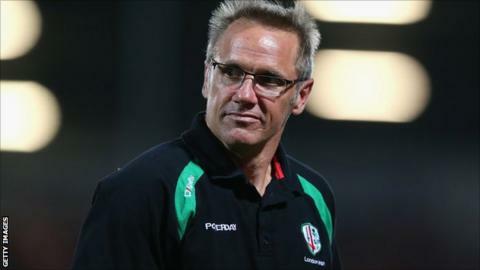 London Irish director of rugby Brian Smith believes his side have earned the respect of the Premiership after their good start to the season. The Exiles have won two from five but have also earned losing bonus points in the three games they have lost. They face Exeter on Saturday and Smith feels a win would represent a decent opening period of the season. "Hopefully we are gaining the league's respect week on week," Smith told BBC Radio Berkshire. Smith side's were beaten by Northampton at the weekend and he added: "We can't control that too much (respect). "We can control our own mindset. While we got a point at the weekend, it was not what we were after. We wanted the four points. "We are disappointed but we know we have this weekend to get it right. We see Exeter as an opportunity for us to get the performance right but also to get a result. "If we do that, then at the end of the block of six, it would be a pretty good result." Smith says full back Tom Homer is expected to return to action in the next couple of weeks to further boost the Exiles. The 24-year-old limped off with a knee ligament injury following a collision six minutes into their first game of the Premiership season, against Harlequins at Twickenham. The injury was a significant blow for the Exiles as Homer missed most of the 2013-14 season after picking up a groin injury during a pre-season friendly. Wallabies star James O'Connor, who was brought in to replace Homer during that time, left Irish for European Champions Toulon in the summer. "We've been trying to get Tom ready for the first European round," Smith said. "If it's not Rovigo then it'll be Grenoble the following week. "We're expecting him to be right in the next couple of weeks. The club is really looking forward to him coming back because he's a big contributor to the team." Meanwhile, London Irish say lock forward Nic Rouse will be out for the next 12 weeks after suffering a shoulder injury.